Psychic Cottage » Thinking Out Loud. Who Knew? My Clematis turned into Morning Glories. September 30th, 2008 | Category: Musings by Sharon,Thinking Out Loud. Good Morning my Friends. How are you this glorious yet thunderous morning? I have a few days off before going out there and making some cash so I’m feeling mighty creative and what better way to get creative then on my blog. 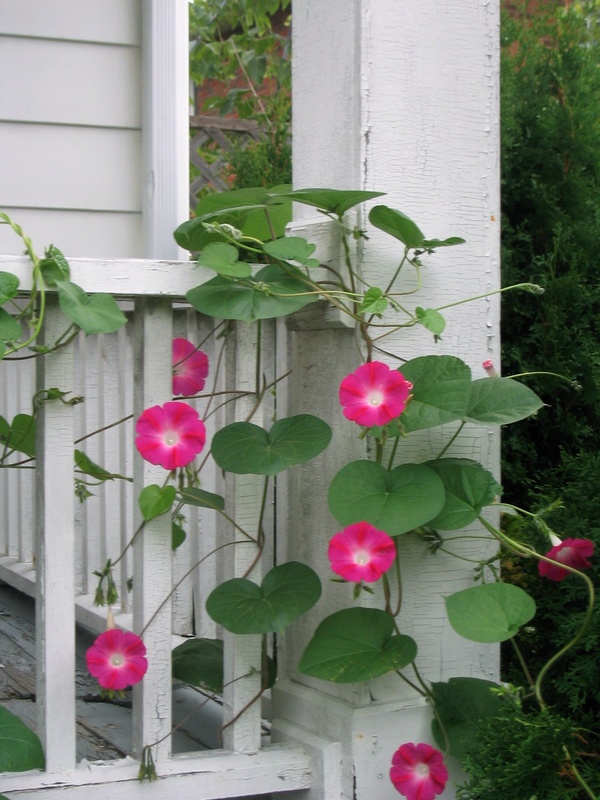 So I have to tell you our front porch has been taken over by……Morning Glories. My sister was right. They weren’t Clematis. Remember my blog about the Clematis? I really thought they were. Obviously not the greenest thumb at the fair. Notwithstanding all that I wanted to show you how beautiful my “Morning Glories” are. I really didn’t have to do anything they just grew like crazy. They are all different colours too. It got me thinking you know. Next door to us we have a bit of an “odd” neighbour . (I’m sure they are saying the same thing.) They took out their cedars and put these things that look like an old stick fort from many moons ago. They said to us as they were hacking the poor cedars down and making big gaping holes that our dogs were planning their escape with that they were putting up these “fort sticks” and they would be a beautiful live fence in no time. I think they said 3 weeks or 3 months. I can’t remember. I know Bobby wrote it on the calendar for fun. Well we plugged up all the holes so our dogs couldn’t run amuck and watched and watched and nothing happened. The funny part is that me who couldn’t grow anything if my life depended on it planted these morning glory seeds, thinking they were Clematis and they grew everywhere. Twisting and turning in a glorious fashion like they do. If you ever get thinking about God’s existence just watch them grow. They will provide the proof you need. I couldn’t help but think why didn’t they just plant morning glory seeds around these “fort sticks”? It would have been breathtakingly beautiful. I’m not saying the “fort sticks” weren’t supposed to be beautiful but something totally backfired. All I can say is I hope they came with a guarantee and I hope they left a sacred offering when they hacked out all the cedars. September 27th, 2008 | Category: Musings by Sharon,Thinking Out Loud. I got your attention didn’t I. As you know the strangest things amuse me. I have been spending time with my grand cats and I am so fascinated with the whole kitty litter ritual. I asked my Friend Kaleigh if she thought a blog on “Kiddy” litter would be too out there. She said it would be really “out there” if you wrote “Kiddy” instead of “Kitty”. Oops. What I do is every time I go visit the cats I clean the litter. I don’t remember changing the litter hourly when having cats when I was younger and I really don’t remember it being so easy. I just remember this awful amonia smell from the litter. Times have changed. So I clean the litter while sitting with them with this little plastic tool I bought. This leads to both the cats having to take their turn and messing it up by using it immediately. I then do it all over again and this goes on until I finally give up and/or end my visit with them. I find it strange that they try and use the carpet outside the box to cover their “droppings” or the hard plastic on the side of the box. Obviously not the sharpest tools in the shed as my friend Terry would say. P.S. I promise I’ll think of a better subject next time.